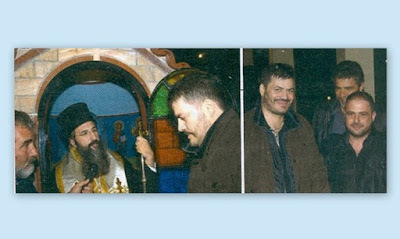 So, on the day of the feast of St. Spyridon, Manolis Kontaros was again with his family in his home in Rethymno, where the inauguration of the chapel took place and a Divine Liturgy was celebrated. Excited, the singer stood up and walked to the chapel, where his friends - over 1,500 people - had gathered to smother him with hugs. Shortly after he took his lyre and all together they had fun with Cretan couplets, appetizers and raki." Source: From Orthodoxos Typos, January 2012. Translated by John Sanidopoulos.